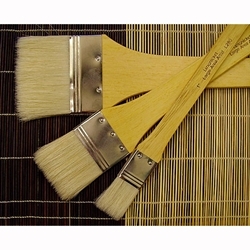 Royal Brush Large Area Brush Set - White Bristle with Long Handles - This economical brush set has three wide, natural bristle brushes- one 1 inch, one 2 inch, and one 3 inch. All have sturdy, long wooden handles. These are ideal for manipulating large amounts of thick paint, laying down basecoats and gesso, and using with varnishes. 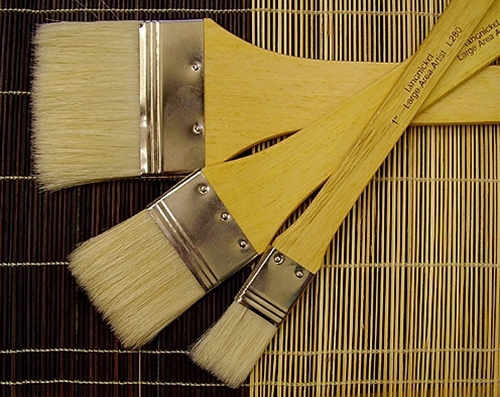 They are also great for use with faux finishes and glazes. They are so inexpensive, you can even use them as glue brushes for collage, scrapbooking, and bookmaking!